With the 3D Mechanics Editor you can create 3D dynamic models of mechanical structures. The resulting 3D mechanical model can be connected with other 20-sim components. 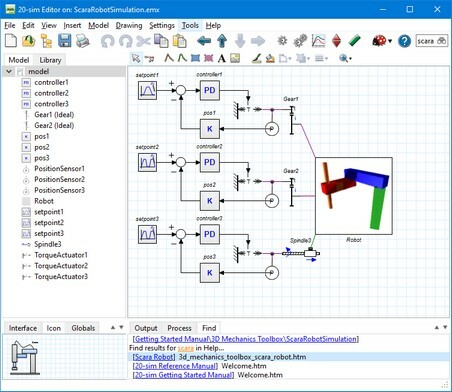 In the example shown below (Getting Started\3D Mechanics Toolbox\ScaraRobotSimulation.emx), you see a robot model that has been generated with the 3D Mechanics Editor. The model has two actuated rotation joints and one actuated translation joint. The rotation joints are directly coupled to gearboxes. The translation joint is coupled via a spindle. In 20-sim you can use plots to show the simulation results and use the 3D Animation Toolbox to show an animation of the 3D model.